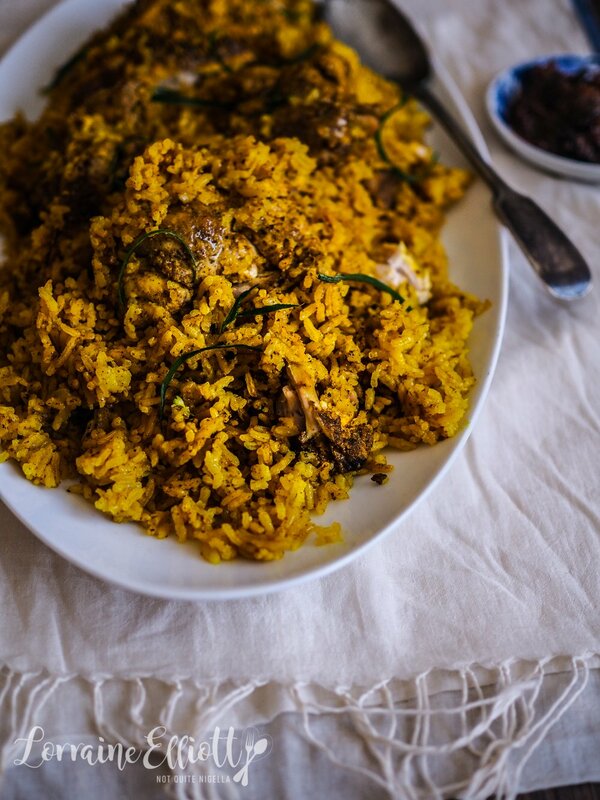 I have to admit that I love biryanis and the most vivid memory I have is of being in a hawker centre in Singapore, at the stand for the best biryani and watching the man open up an enormous pot and scoop out a layer of rice and then search for some chicken buried under the rice. 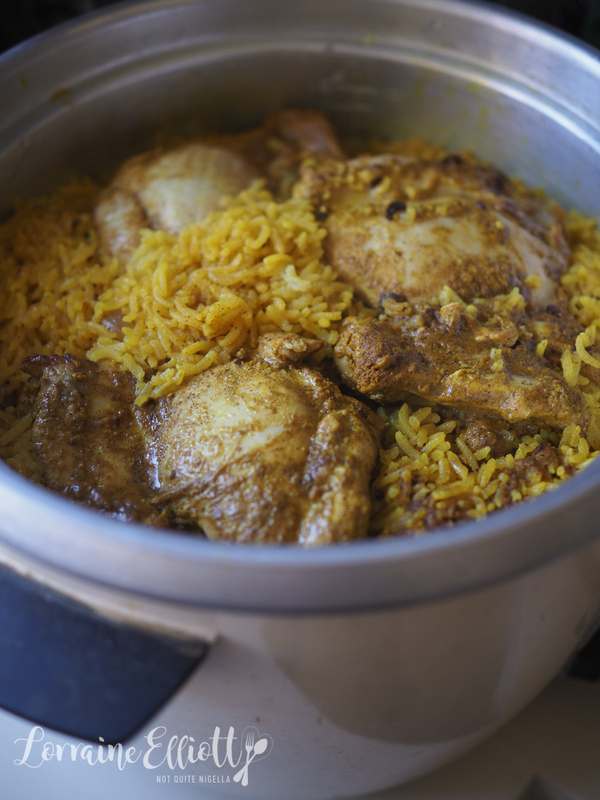 The aroma of the spices tickled my olfactory senses and my mouth started watering. I couldn't wait to eat it and it was every bit as good as my nose promised me it would be. I don't tend to make them at home because I thought that they might be hard to make. But I am always excited when I see it on a menu and when I recently stayed at Cape Kudu hotel on Koh Yao No in Thailand it appeared on the breakfast buffet. It was so delicious that I asked them for the recipe and they offered to show me how to make it in a cooking class! And please don't let the long list of ingredients put you off. It's mostly spices really. 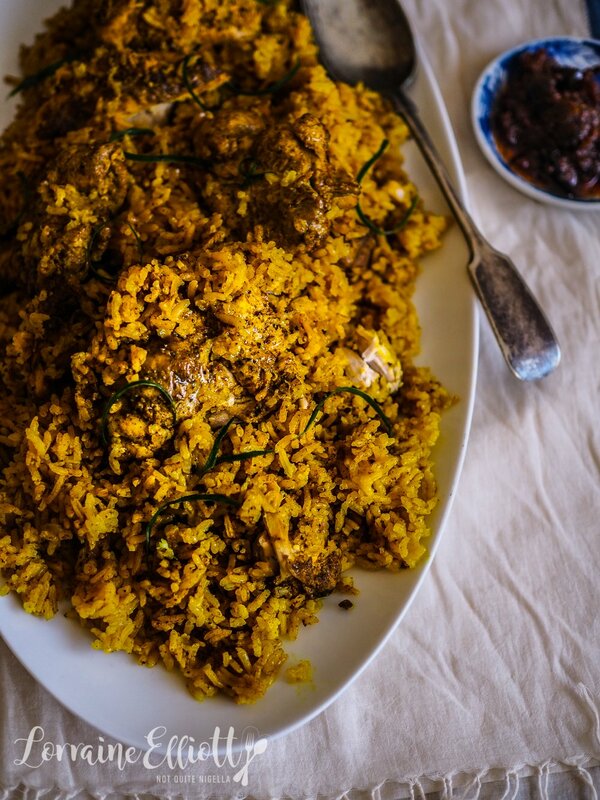 In Thailand they call this kao mok gai or Muslim yellow rice and chicken. 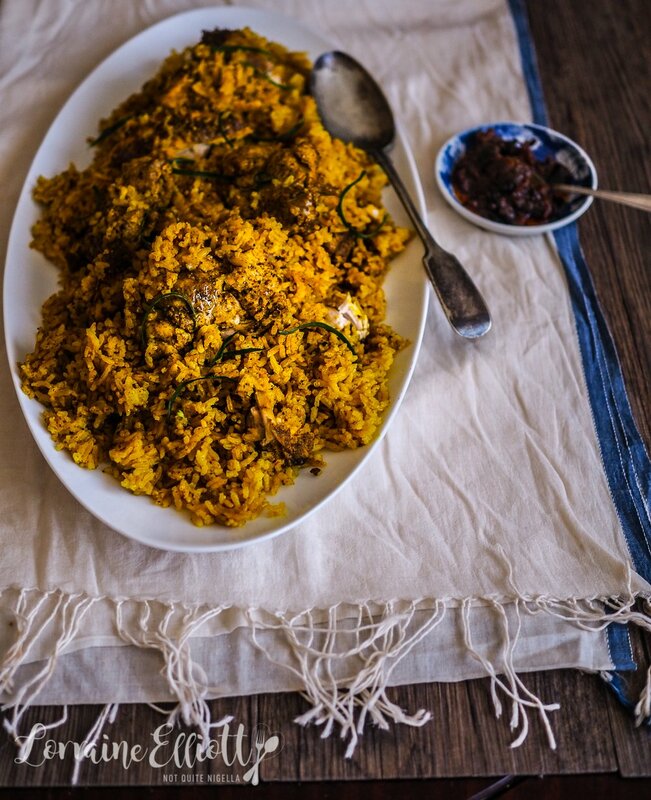 It smells incredible while it is cooking and all you need is a rice cooker or a large pot. 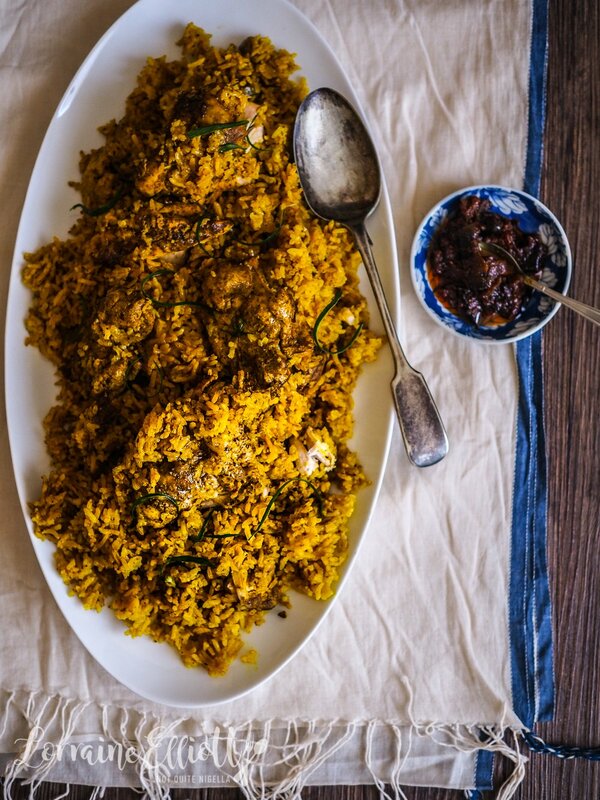 It makes enough to serve 10 so I'd save this for when you have a large group of friends or family coming over. The aroma of this cooking will drive them crazy with desire. Speaking of smells driving me crazy with desire, the other day I was at the shops doing some grocery shopping. Mr NQN had gone to the car to put away some purchases and was going to meet me back at the supermarket. I was wondering down the aisle putting things in my basket when an aroma hit me. It was the smell of baking bread. The smell of freshly baked bread to me is akin to a snake charmer playing a flute. It lured me in. I followed my nose towards the bread hypnotised. Then Mr NQN broke into my reverie. "Did you mean to do that?" he said with a mixture of concern and amusement. "What? huh?" I said confused still looking for the bread. "You looked straight at me in the eyes and then walked away towards the bread," he said. "What? Are you sure?" I said my brow furrowing. I had no recollection of seeing him whatsoever. I certainly did not remember looking him in the eye at all. "I think...I was hypnotised by the bread?" I offered weakly. Luckily he knows how susceptible I am to the lure of food and didn't take it personally! 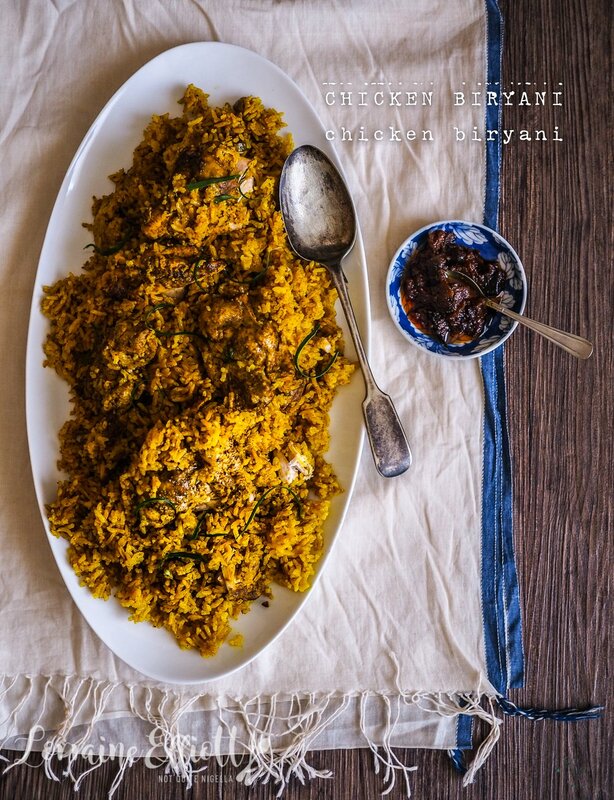 So tell me Dear Reader, have you ever made a biryani? What is your favourite food smell? Do you go into a zone? 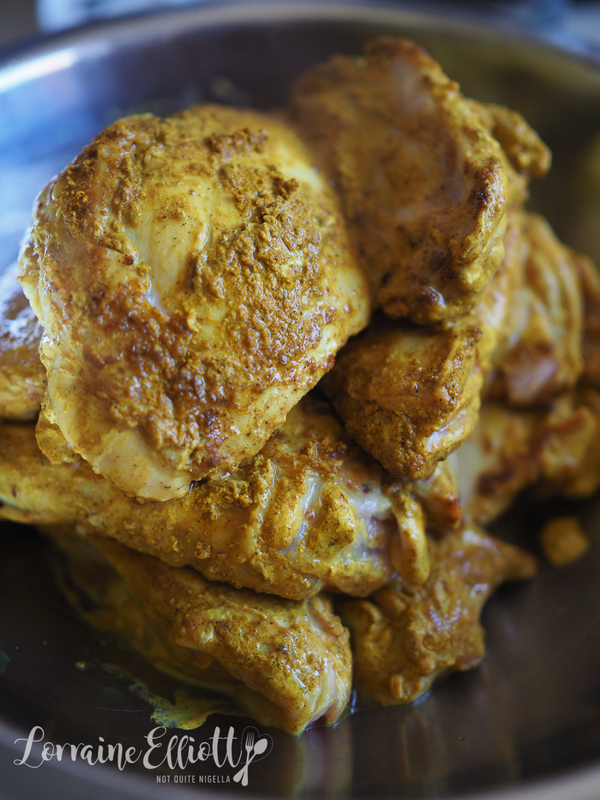 Step 1 - In a dry pan, roast the turmeric, curry powder, black pepper, coriander, caraway, cinnamon, nutmeg and bay leaves. Then place in a spice grinder or mortar and pestle and blitz until fine. Divide in equal portions. 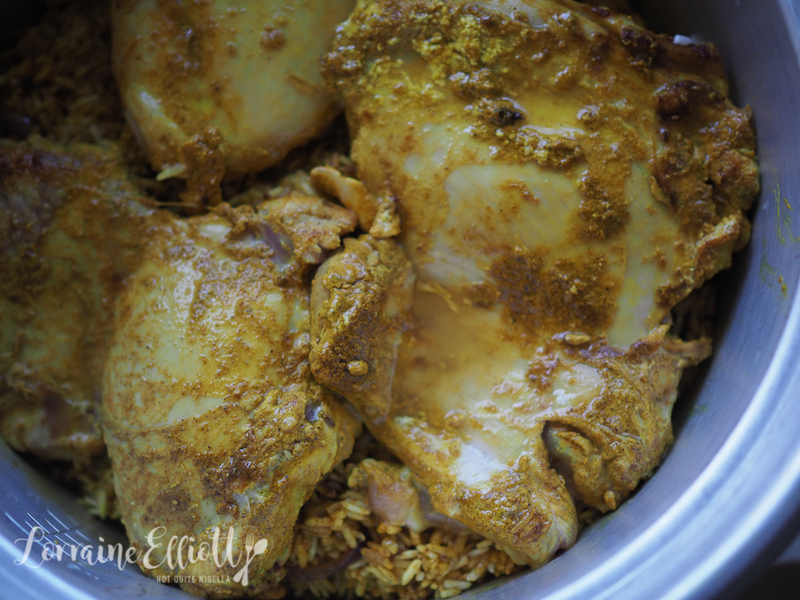 Step 2 - Mix one half of the spice mix with the yogurt and coat the chicken pieces all over. Marinate for 6 hours or overnight preferably. Bring the chicken to room temperature 1 or 2 hours before you cook it. 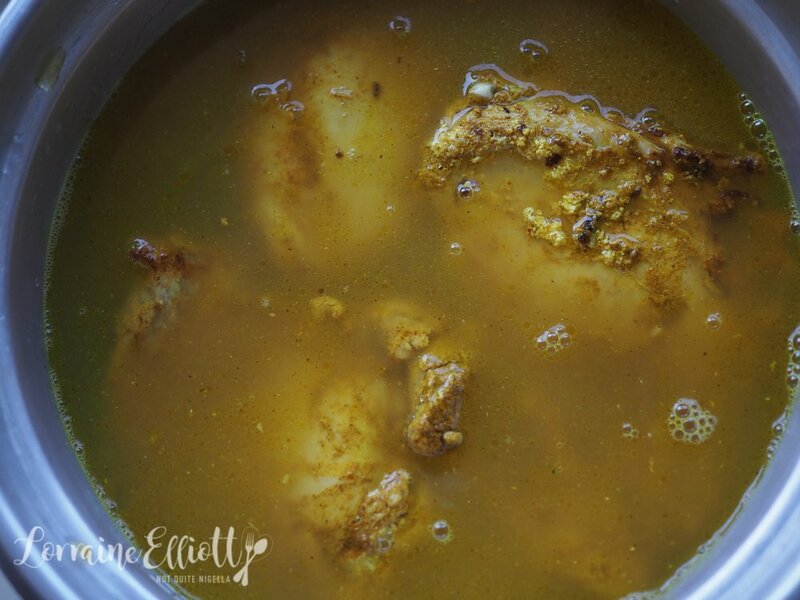 Step 3 - The next day add a couple of tablespoons of oil to a pan and brown the chicken, adding more oil when needed. If it sticks to the bottom then deglaze with the chicken stock. Then add the butter to the pan and fry the shallots (don't worry, there is a lot of butter for the shallots), then add the rice and the remaining half of the roasted spice mixture, the sugar and salt and coat the rice well. 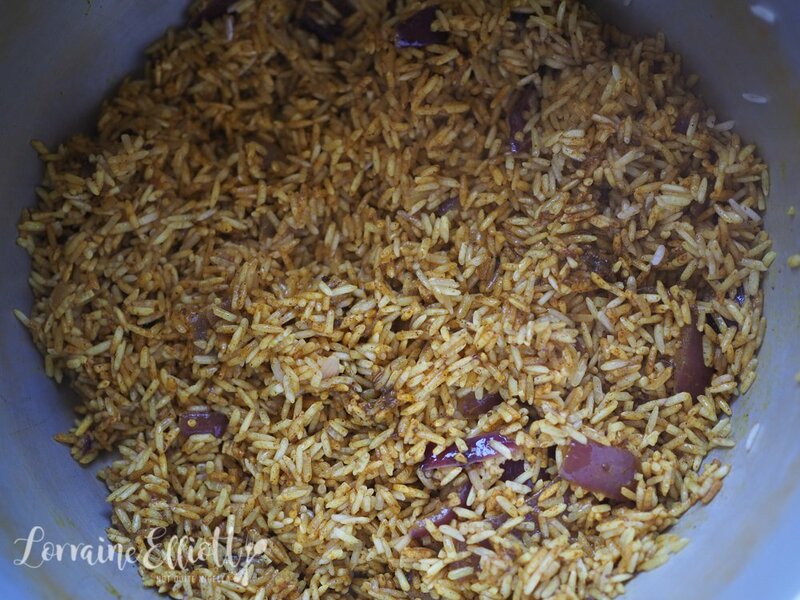 Step 4 - Place half of the rice mixture on the base of a rice cooker or large pot and then place half of the chicken thighs on top and repeat with the remaining rice and chicken. Pour over the chicken stock (I also make sure to use the chicken stock to get any scrapings of spiced yogurt in the bowl and the spices at the bottom of the pan). Cover and cook for 30 minutes or until the rice cooker automatically turns off.